via email from Sandra Laurenson, 10-5-09 I did find one other reference on Google (attached - one small paragraph near the end) that I ended up purchasing from the LATimes archives as the Google link wasn't complete. She finished her stunting career with a pilot named Delmar Snyder but would not change from car to plane or plane to plane with him. He was no Brock. Still, her last day in the air-it was Sept. 8, 1928, in Bethany, Mo.-was memorable. Her diary shows that she hung by her toes, hung by her ankles, did the standing loop, the breakaway and the spread eagle." "I was glad it was over," she said. "The engine was acting up." 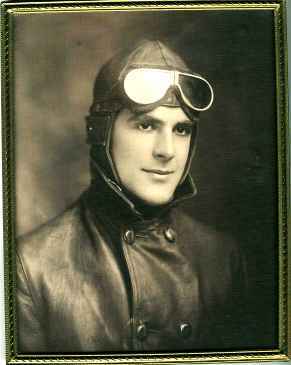 I know he was a pilot briefly in World War I (the war ended), that he was a pilot for a while for the evangelist, Amy Semple McPherson, and that he did aerial survey work for several years before I was born. Shortly after I was born, he went to Florida to fly for Pan Am (I think) to Algeria early in World War II, but his eyesight began to fail. He never returned to Ohio and his family. When I met him as an adult, he was an old man. My brother once found a reference about him a a book about bush pilots. He was "handsome and charming" but apparently borrowed $250 from someone and never paid it back! Transcribed by Bob Davis - 2-17-05 Youngstown, O., Aug. 15(AP) - Gladys Roy , 25, attractive aviatrix who had planned a New York to Rome airplane flight as a climax to years of stunt flying, died in a hospital here tonight from injuries received when she was struck by a whirling propeller at Watson field here late today. Rushed to a hospital after the accident, surgeons there reported her skull was torn away by the spinning blade. The accident happened as the noted aviatrix climed aboard a plane which was motionless on the ground with its motor running. Miss Roy arrived in Youngstown today on a business trip. She appeared in a plane stunt act at Kinsman fair grounds yesterday and was to have appeared near here in another exhibition feat early next month. Her home was in Minneapolis. Miss Roy, well known in aviation circles since 1920, was being groomed for a New York to Rome flight. Her co-pilot in the flight was to have been Lieutenant Delmar Snyder. She recently paid a visit to Lieutenant Snyder's mother in Cleveland. Miss Roy had climbed into the plane to have her picture taken with an Ohio bathing beauty who won a place to compete in the Atlantic City annual bathing beauty contest. The picture was nearly finished being taken when the woman flier started the engine, stepped down from the fuselage and unconsciously walked into the propeller. She is the holder of several parachute record jumps from airplanes. "Chadwick Smith, her brother, also is a pilot. He flies a mail plane between Chicago and Minneapolis. (10-28-10), you will find about 53 links. The one cited above appears to be the most helpful. Snyder was born on December 7, 1895 in Saint Louis, Missouri. He died on June 6, 1987 in Miami, Florida.